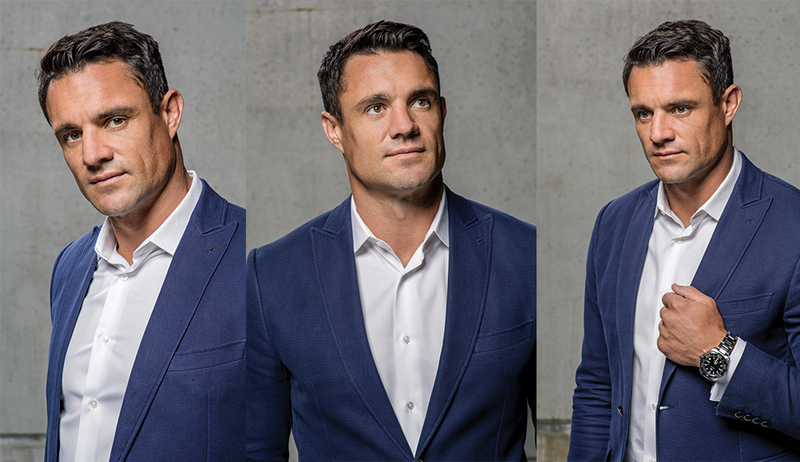 While Dan Carter has spent the last few years playing in France and become a TAG Heuer ambassador alongside global superstars like Bella Hadid, Tom Brady, Cara Delevingne and Chris Hemsworth, his All Black career is well and truly etched into New Zealand history. While his All Black jersey might not have seen action for a while, he has still been doing his bit for New Zealand with the charity foundation that he co-founded, iSport, which provides funding for kids to get into sports. We catch up with Carter while he is town to raise funding for iSport with the help of a limited edition TAG Heuer Aquaracer. Carter then heads off to Japan on the next and possibly final chapter of his rugby career to play for the Kobe Steelers. While rugby might have been the foundation for it, it seems that his legacy will go beyond. What’s one of the first things you do when you come back in to New Zealand? Depends on whether I’m coming to Auckland or Christchurch. If I can get home to Christchurch, I love to shoot out and raid Mum and Dad’s fridge. It’s like just a habit now. Say “hi” to mum and dad and then go to the fridge. I don’t eat anything, for some reason I go and raid Mum and Dad’s fridge. It’s one of the first things I do when I get back to New Zealand. France has got beautiful cheese and wine of course but was there anything in particular food-wise that you missed from New Zealand? get that produce. You have to wait again until Friday, shopping two or three times a week just to get your weekly food, where you kind of get it all in one hit here. It’s those sort of details that you don’t think about I guess, when you decide to have part of your rugby career in another country like France. And you can’t actually relax going into those places, because you have to speak French. So you’ve said it in French in your head a hundred times, what you’re going to say and you go to say it and you say it completely wrong or you muddle all your French up. You can relax, it’s easy enough going into a shop here in New Zealand. I can just speak English and say whatever you want and they’ll understand. Those times I’m hungry, I just wouldn’t go and get something, I’d wait until I got home. I wanted to avoid those awkward French conversations. Have you started learning some Japanese phrases? I started speaking a little bit of French, especially over the last six months that I was there and now that I know that I’ve got to go through the whole process again in Japanese, it’s actually really put me off. But I haven’t started, it’s super slack. I know I should of, I know that once I arrive in Japan I’ll have to. So, I’ve kind of just been delaying the inevitable, up until I arrive where I’ll just try and cram it all. Brilliant. Now, you’re going to be auctioning off a limited edition Aquaracer which will be signed by you for your iSport Foundation. Can you talk about what was the catalyst for that and why you started it? Well, one of the reasons we started iSport was after the career that the two other founders, Ali Williams and Richie McCaw and I had. We had this amazing career in rugby and a great upbringing as well. We were supported all our way through and we just wanted to use sport as a tool to be able to give back to Kiwi kids. We realised how expensive it is to play sport in New Zealand with sporting fees, travelling to tournaments, competitions, equipment, things like that. It’s actually very expensive and not all families can afford for their children to play sport. So, we wanted to provide a foundation to give back and give an opportunity to these less fortunate people, just to help encourage them to play sport. And, potentially live their dream in the sporting field, like we had, because our dreams were always to play for the All Blacks and we were fortunate enough to be able to do that. And for an amazing company like TAG Heuer to get involved and bring it back to New Zealand to do an event like this. To make such a limited edition, quality timepiece like this, and then to give the funds back that they were raising in the auction to iSport. It’s just so generous, very overwhelming and we’re extremely pleased about their generosity. How did the relationship with TAG Heuer come about? I’ve been friendly with the brand for about 10 years now. The Australian GM, Philip Richards, I’m good friends with him. He is a Kiwi and an All Black’s supporter. I was made an official ambassador a couple of years ago. They’ve got some amazing ambassadors on their books. To be one of those alongside those other personalities around the world is pretty humbling really. Yeah. Do you feel like you’re part of another club? It’s honestly like a cool family. I’ve been to different events where some of the other ambassadors are there and they’re all absolute superstars and are just so nice and welcoming and extremely friendly but as a Kiwi, you can get pretty intimidated. Obviously your sport has been your success but can you define other ways that your sport has defined you as a person? Yeah, well and truly. The person I am today is a lot of it is to do with rugby and sport and being involved in a team sport in particular. So, I’ve had some great learnings and playing for the All Blacks for so long teaches you a bit of life lessons. You have a lot of setbacks playing professionally for as long as I have. And just the same with life, you’re always going to have setbacks and it’s how you react and bounce back from those setbacks. If you’re wanting to be the best, it can’t just happen by fluke, it’s all about working mix. I’m extremely hard working because I don’t want to let my teammates down and I want to be the best I possibly can. But also the humility is a really important part of my life. No matter what you achieve in your life and your career, I think it’s hugely important to remain humble and keep your feet on the ground. That’s one of the key things that we really work hard on in the All Blacks and I’ve taken into my life as well. So, the success that I’ve had in my career is not going to change me as a person, I like to think I’m still the same person as I was before I started playing rugby professionally. So yeah, there’s a couple of things there that have really helped shape me to the person I am today. Was there a lesson that you learnt from your time in France? I think the importance of a family was a big thing. It’s always challenging living so far away from friends and family. I think it really strengthen the importance of that and I guess that’s a big reason why we’re looking to move back to New Zealand, to be closer to our friends and family. It was hard being away, but obviously having my young family there was hugely important. That was part of the reason I wanted to go and play there was to spend more time with them. When you’re playing professionally here in New Zealand, you’re always travelling to Australia, South Africa, all over the world and you just don’t get to spend a lot of time at home. That was a great lesson. Is there a lesson that you think you left them with in France from a New Zealand perspective, that humility maybe? Something I was quite surprised about is that rugby over there is a job and a lot of the players, they play rugby because they’re providing for the family. Because of that, it becomes quite individualised, like it’s about them. They just want what they can to keep their job and I actually found that they weren’t putting the team first. They were putting themselves ahead of the team, which in team environment, that’s never going to work. And so that was a real surprise for me and something I worked really hard on the last year or two of living there, was just to make sure that the decisions that the players were making were for the benefit of the team. It felt like they were starting to make a little bit of progress, in the last year in particular. Much the same can be said for business organisations also in terms of culture. And you’ve been involved in some interesting investments. Is that something you’re getting more and more into? You start thinking about life after rugby and as long as I’m playing rugby, rugby is still going to be my priority. The reason I get out of bed is to be a better rugby player each day and that will continue until I eventually hang the boots. But, it’s something I’m starting to do a little bit of work on. I’ve got the Laundromap my retirement home, a few other bits and pieces as well. So, I’m probably not contributing a lot to those businesses, but they’re sending me all the information on how the business is run, so I’m learning by having a little bit of skin in the game without being a decision-maker or anything like that, because I’m in no position to do that. My focus is rugby. But it’s nice to learn a little bit about how businesses run, the challenges that comes with being in business, how to be successful, things like that. And yeah, there are a few things about work ethic and working well as a team that we just mentioned before, that correlate to the business world as well. All those investments seem quite diverse, is there some sort of business philosophy that you follow? I’ve been in a lot more safer things that are not really publicised, so I have a portfolio. They’re just some of the more high risk ones that I’m involved with, but I’ve got a balance to make the most out of the money that I’ve been able to make over the last 10-15 years. 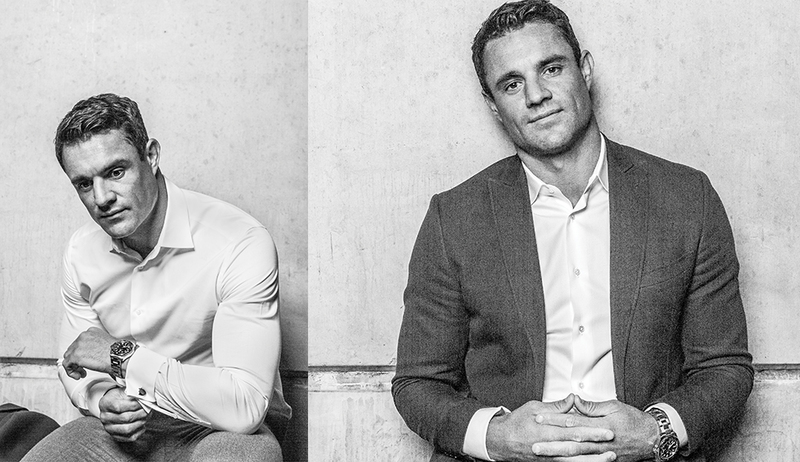 Now, obviously it’s not all about making money, and you’ve spoken about life after rugby and maybe after Japan, and really the focus on helping people and maybe carrying on what you’ve done with iSport but perhaps helping developing countries and that kind of thing. Have you started to form a picture of what that might look like yet? Oh not really, it’s just something I want to do. Everyone asks ‘what are you going to do when you finish rugby?’ and to be honest, I’m probably just going to take a bit of time out. But I want to use rugby and sport to give back, because it’s given this amazing life that I’m living today. So, I’d love to do a lot more charity work with iSport, with other charities all over the world too. I just love the satisfaction that you get when you’re able to make a difference to a person’s life and I’m seeing that with iSport. Some of the young kids that we’ve sponsored and given grants to and just to see the satisfaction on their faces that they are able to do what they love. Or some of other children that are going through really tough times and just put a smile on their face for a day or whatever it might, just really makes a difference. I’d love to do that for a couple of years once I finish playing and have a bit more free time on my hands before I sort of decide exactly what I want to get into. Alright, I’ve got two more questions for you. The next one is very in-depth but what’s your normal breakfast? My normal breakfast…eggs on toast. I love poached eggs, I would eat up to four poached eggs in the morning and a smoothie. I love making my morning smoothie, I pride myself on my morning smoothie with all sorts of different treats in there to get me ready for the day. And final question, best piece of advice you’ve ever been given? My mum always used to tell me to be careful, but that was just your typical mother worrying about her youngest child, just be careful, be careful. But I got some advice from Robbie Deans when I first made the Crusaders. Andrew Mehrtens and Aaron Major are a couple of absolute rugby legends I used to look up to. He [Deans] told me that I wasn’t allowed to just be there to make up numbers, because he thought I was just going to come into the environment and kind of be happy to be part of the squad rather than push them for their positions. And I thought that was crazy because ‘could I really be starting ahead of these rugby legends?’ So, he showed a lot of faith in me and as of that day I’ve never settled for second and I’ve never been there just to make up numbers. And after he gave me those wise words, I worked harder than I have ever worked and a couple of months later I was actually starting ahead of those guys. How strange that was. It was off the back of Robbie Deans and the advice that he gave me and the trust and support that he gave me to push me to be the best player I could be. Robust and water-resistant to 300 metres, this watch — featuring a ceramic uni-directional rotary bezel, with its twelve sides and six studs, screw-down crown, large luminous indications on the indexes and hands for improved visibility and screw-down case back engraved with a diver’s helmet — is immediately recognisable. The TAG Heuer Aquaracer 300m timepiece is equipped with a 43mm case, the ceramic bezel with the silver lacquer numerals offer effortless sophistication. At its heart beats the Calibre 5 automatic mechanical movement, offering proven accuracy and reliability an essential timepiece for all sports enthusiasts. 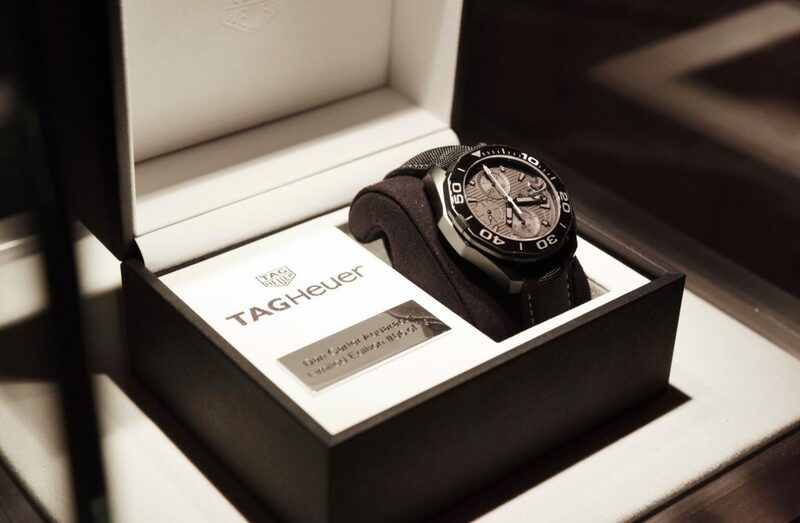 As a celebration of their partnership, TAG Heuer and Dan Carter have collaborated on a special edition of the Aquaracer watch. With black details reflecting his time wearing the silver fern and home, this watch adds that extra edge of patriotism to this classy timepiece.